In the last thirty years, there has been a massive expansion of coal mining, predominantly for export but also for coal-fired power stations. In 2009-10 Australia total raw black and brown coal production was approximately 539.79 million tonnes. Of the total raw coal production approximately 267.6 million tonnes was produced in Queensland, 190.1 million tonnes in New South Wales, 8.39 million tonnes in Western Australia, 68 million tonnes of brown coal in Victoria, 3.84 million tonnes of black coal in South Australia and 680,000 tonnes of black coal in Tasmania. 97% of Australia's total coal mining production came from the Queensland and New South Wales coalfields. Of the estimated 471 million tonnes of raw black coal produced in 2010, 365 million tonnes were saleable. The Australian Bureau of Agricultural and Resource Economics estimated 300 million tonnes were exported, despite the impact on production in Queensland from abnormally high rainfall late in the year. ABARE estimated that during 2010 exports of metallurgical coal increased by 18 per cent to 159 million tonnes and , while thermal coal exports increased by 1 per cent to 141 million tonnes. Coal exports earned $43 billion in 2010. In 2010 ABARE estimated that approximately 157.26 million tonnes of coal exports were metallurgical coal. Of this, it estimated that 97.7 million tonnes were of "high quality" coal which was sold, in order of value, to Japan, India, the European Union, China, Korea,Taiwan and Brazil. A further 59 million tonnes of metallurgical coal was sold. Thermal coal exports were estimated to total 134.98 million tonnes, with 66 million tonnes to Japan, 24.84 million tonnes to South Korea, 19.55 million tonnes to Taiwan and a little over a further 24 million tonnes to other countries. Based on 2009 data, the World Coal Association ranked Australia as the world's largest coal exporter and the fourth largest hard coal coal miner. (The latter ranking excludes brown coal). Just under 80% of the coal mined in the country in 2010 was from open-cut mines. As of July 2012 coal prices in Australia have dipped 30% since the beginning of the year, largely because of a dip in Chinese demand. Coal mining in Queensland is predominately in the Bowen Basin along with mines at Newlands, Blair Athol, and near Brisbane. In New South Wales the bulk of the coal mined is from the Gunnedah Basin. BHP Billiton Mitsubishi Alliance (BMA), which is a 50-50 joint venture between BHP Billiton and Mitsubishi Corp. of Japan, accounts for more than one-quarter of Australia's annual coal exports. For a full list of current Australian coal mines see Current Australian coal mines. In April 2010 ABARE released detailed of dozens of new or under construction coal mines in Australia. See ABARE April 2010 major projects list for more details. (ABARE's next detailed listed is scheduled for late May 2011). In January 2011, floods in the Australian state of Queensland had cost companies in the country $2.3 billion in coal sales. Analysts reported that it could take months for coal production to resume. Since December 2010, about two-thirds of Queensland, an area twice the size of Texas, has been ravaged by massive flooding, which hampered coal mining and transport operations. The Queensland Resources Council predicted in late January 2011 that coal production would crash by between 25 and 50 per cent for the country's forthcoming March quarter. It was estimated that Queensland's gross state product for 2010-11 would take a hit of at least $4.5 billion, rising to $8 billion on the Queensland Resources Council's worst-case scenario. See bottom of the page for a map of Australia's existing and proposed coal terminals. Abbot Point Coal Terminal is an export coal terminal which is ultimately owned by the Ports Corporation of Queensland, a Queensland government-owned business. The coal export terminal is operated by Abbot Point Bulk Coal Pty Ltd, a subsidiary of Xstrata Coal Queensland. In April 2011, the Indian company Adani Enterprises, the country’s largest coal importer, agreed to pay A$1.83bn ($1.98bn) for a 99-year lease on the Abbot Point Coal Terminal. The bid was among a number placed by Indian groups in Australia and elsewhere as the country to secure energy resources to meet rising demand for power to complete infrastructure projects in India. Hunter Ports is currently developing a $2.5 billion coal terminal on the former BHP Steel site on the Hunter River in Newcastle, Australia. The port would ship this coal to Asian markets. The planned Hunter Ports terminal is subject to state government approval to use the proposed site, may start exports from 2015. Existing coal mines and projects in and around the Hunter Valley, where Rio Tinto Group and Xstrata Plc own mines, would support additional annual exports of 65 million to 90 million tons of coal “if there is the infrastructure". Like several other coal exporting countries including Indonesia, in recent years Australia has seen the rise of resource nationalism, i.e. policies directed at capturing an increased share of the returns from natural resource exports. In February 2008, in response to a growing wave of coal and iron ore mining proposals by state-owned Chinese companies, the Australian government adopted a new policy of screening investments on the basis of national concerns. The new policy replaced foreign direct investment (FDI) policies that had been in place since 1992, when the Keating Goverment removed special rules under its "One Nation" liberalization program. The Minerals Resource Rent Tax (MRRT) is a proposed tax on profits generated from the exploitation of non-renewable resources in Australia. It is the replacement for the proposed Resource Super Profit Tax (RSPT). The tax, levied on 30% of the "super profits" from the mining of iron ore and coal in Australia, is proposed to be introduced from July 1, 2012. The RSPT was initially announced as part of the initial response to the Australia's Future Tax System review, known as the Henry Tax Review, by theTreasurer of Australia, Wayne Swan and the then Prime Minister, Kevin Rudd. The tax is similar in concept, although different in operation, to the existing Petroleum Resource Rent Tax levied on off-shore petroleum extraction activities. The RSPT was to be levied at 40% and applied to all extractive industry including gold, nickel and uranium mining as well as sand and quarrying activities. The tax was replaced by the MRRT following the appointment of Julia Gillard as Prime Minister of Australia in late June 2010. The controversy regarding the RSPT was such that an "ad war" between the government and mining interests began in May 2010 and continued until the downfall of Prime Minister Kevin Rudd in June 2010. The Australian Electoral Commission released figures indicating mining interests had spent $22m in campaigning and advertisements in the six weeks prior to the end of the Rudd prime ministership. Mining interests re-introduced the advertisments arguing against the proposed revised changes during the 2010 federal election campaign. On the November 23, 2011, the tax passed through the lower house with the support of the Greens. The bill is scheduled to be debated at the Senate in 2012. Experts are concerned that Australia, which has higher carbon dioxide emissions per capita than any country on earth, may also be the first to collapse from the impact of climate change. A study by the Commonwealth Scientific and Industrial Research Organisation described its ecosystems as potentially the most fragile and vulnerable to climate change, in part because its climate is already hot, dry and variable. In addition, the population is concentrated on the coast, subjecting it to the rising oceans and damaging storms that accompany global warming. Australia's summer of 2009 has already shown record temperatures and drought in the country's worst heatwave in history. For the first time on record, temperatures passed 43 degrees Celsius (109.4 Fahrenheit) for three days in a row, while other cities broke similar records. Most of the southern portion of the country is undergoing an unprecedented 12-year drought, and agricultural productivity has decreased dramatically. Experts say it will get worse as global warming continues. Even slight temperature increases are expected to worsen drought by 70 per cent in New South Wales and cut Melbourne's water supplies by more than one third. Professor David Karoly of the University of Melbourne warned that, while the record heat seems unusual, "it will become much more like the normal experience in 10 to 20 years." Kwinana Power Station with Carbon Capture and Storage, proposed in 2007 by Hydrogen Energy, a joint venture of BP and Rio Tinto. The 500 megawatt project was quietly shelved later that year. Redbank 2 Power Station was a 151 megawatt power station proposed by National Power to use coal tailings and cost $230 million to build. In 2003 the proposal was rejected by the NSW Government. the NSW Infrastructure and Planning Minister, Craig Knowles, told parliament that "Redbank 2 would generate greenhouse emissions higher than the state average and at a higher intensity than other coal-fired station in the Hunter Valley," he told parliament. The company lodged an appeal against the government's decision in the Land & Environment Court in early 2004. Climate Action Network Australia (CANA) joined the case as a third party. However, prior to the commencement of hearings scheduled for November 2004 the company abandoned its appeal. Linc Energy is a Brisbane-headquartered company that has proposed to develop a "commercial Underground Coal Gasification (UCG) to Gas to Liquids (GTL) operation" in the Walloway Basin. It has floated the prospect that it could -- as a second stage in a project based on converting underground brown coal to gas -- build a 250 megawatt power station. See Walloway Basin power station. Arckaringa Coal-to-Liquids and Power Project is a proposal by Altona Resources for what it describes as "an integrated 10 million barrel per year Coal to Liquid (‘CTL') plant with a 560 MW [megawatt] co-generation power facility." Caroona Coal Project, BHP Billiton, New South Wales. While the company has discussed the project as only comprising a proposed coal mine, concerns have been raised that the company is also required to investigate the possibility of an associated power station as well. FuturGas Project, South Australia is a proposal by Hybrid Energy Australia for a 300 megawatt brown coal fired power station. In November 2007 it was stated that the project would be subject to a two-year feasibility study. The project has a notional commissioning date of 2015. ZeroGen is a proposed Carbon Capture and Storage project in Queensland. It is proposed by ZeroGen Pty Ltd that the first stage of the project will be to build a 120 megawatts gross coal gasification plant located near Rockhampton in Central Queensland by 2012. "CO2 emissions will be captured at site and transported approximately 220 kilometres by truck for injection and safe storage in deep underground reservoirs in the Northern Denison Trough," the company's website states. The feasibility study on this part of the project is expected to be completed Stage One feasibility study is now expected to be completed by the end of 2009. The second stage of the project, depending on the outcomes of the first stage, would involve the construction of a 400 megawatt CCS project in Queensland at a site yet to be determined. The pre-feasibility and feasibility studies for the second stage are scheduled to commence in the second quarter of 2008. Bluewaters Power Station Expansion is a proposal by Griffin Energy to add a further two 208 megawatt coal-fired generating units (3&4). They originally were proposed to be commissioned in 2012 and 2014 however they have been delayed due to a variety of factors including the fact that Griffin Coal went into liquidation. The company states that it "will also ensure the Bluewaters Power Station Expansion project will be capable of adopting carbon capture technology in the future, once this developing technology becomes commercially viable in Western Australia.". Griffin Group went into receivership at the beginning of 2010, collapsing under nearly $1 billion of debt. Griffin coal has been sold to Indian company, Lanco Infratech, and the Bluewaters 1 & 2 power stations were sold to Japanese companies Kansai Electric Power Company and Sumitomo Corporation in early 2011. As of May 2011, it is not yet clear whether the new owners will proceed with the building of new generating units, Bluewaters 3 & 4. Coolimba Power Station is a 400 megawatt coal-fired plant near Eneabba in Western Australia which is being developed by Aviva Corporation with a scheduled commissioning date of 2012. For a more extensive listing see Citizen action and protests against coal in Australia. However, some of the most recent protests from 2010 and 2011 are below. On July 5, 2011 the NSW Nature Conservation Council released a statement stating that peaceful protesters stopped a coal seam gas exploration rig in the Pilliga Forest, south of Narrabri, Australia. One protester in climbing gear was suspended high above the ground at the top of a 25 metre rig at an Eastern Star Gas operation, with another group of protesters on site. Local groups Friends of the Pilliga and the Northern Inland Council for the Environment, and Newcastle-based Rising Tide conducted the action to highlight the environmental costs of Eastern Star’s proposed 1100 gas well project in the Pilliga Forest. In September 2008 the main climate change adviser to the Australian government, Professor Ross Garnaut, outlined the results of modeling on the impact of global climate change policy. In one of his reports to the government, he wrote that "the future of the Australian coal industry depends critically on the success of carbon capture and storage not only in Australia, but in the rest of the world, and especially in Australia’s major coal markets in Asia." Garnaut reported that the modeling showed that "the introduction of a near-zero-leakage CCS technology (with leakage reduced from 10% to 0.1%) would significantly increase the demand for coal-fired electricity generation and hence increase demand for Australian coal, relative to a scenario with only 90 per cent CCS." ↑ See also Australian Bureau of Agricultural and Resource Economics, "Coal: Table 244", Australian Bureau of Agricultural and Resource Economics, December 2010. (This link is to a downloadable Excel spreadsheet). ↑ World Coal Association, "Coal Market & Transportation", World Coal Association website, accessed April 2011. ↑ World Coal Association, "Coal Mining", World Coal Association website, accessed April 2011. ↑ 7.0 7.1 Pui-Kwan Tse, The Mineral Industry of Australia: 2006, U.S. Department of the Interior, U.S. Geological Survey, May 2008. ↑ "Queensland coal's $2.3 billion toll" UPI.com, January 17, 2011. ↑ "$8bn coal hit wipes year's growth in Queensland" Jamie Walker & Sarah Elks, The Australian, January 28, 2011. ↑ "Adani buys Australian coal port for $1.98bn" Peter Smith & James Fontanella-Kahn, Financial Times, May 3, 2011. ↑ "About" Hunter Ports, accessed November 29, 2011. ↑ 24.0 24.1 "Tinkler Proposes Competing A$2.5 Billion NSW Coal Terminal" Elisabeth Behrmann, Bloomberg, November 29, 2011. ↑ 26.0 26.1 "Full statement and detail of new mining tax" (2 July 2010). Retrieved on 2 July 2010. ↑ "RSPT v MRRT - the differences" (2 July 2010). Retrieved on 2 July 2010. ↑ Kevin Rudd defends mining ads: News.com.au 29 May 2010. News.com.au (29 May 2010). Retrieved on 2010-08-29. ↑ AAP. Mining stocks soar as RSPT ads axed: NineMSN 24 June 2010. Money.ninemsn.com.au. Retrieved on 2010-08-29. ↑ 24 July 2010 12:00AM (24 July 2010). Miners launch new war on Julia Gillard's tax: The Australian 24 July 2010. Theaustralian.com.au. Retrieved on 2010-08-29. ↑ Hudson, Phillip (23 November 2011). Mining tax passes lower house after Julia Gillard, Greens strike deal. Herald Sun. Retrieved on 23 November 2011. ↑ The Minerals Resource Rent Tax bill passed parliament just before 3am. The Australian (23 November 2011). Retrieved on 23 November 2011. ↑ 34.0 34.1 34.2 Geoffrey Lean and Kathy Marks, "Parched: Australia Faces Collapse as Climate Change Kicks In," The Independent, February 1, 2009. ↑ ABARE Australian commodity statistics 2007: Coal Excel Spreadsheet. ↑ "BP and Rio Tinto plan clean coal project for Western Australia", Media Release, May 21, 2007. ↑ Fiona Harvey, "BP axes plan for carbon capture plant", Financial Times, May 12, 2008. ↑ "Hunter power station plan rejected", Sydney Morning Herald, October 14, 2003. 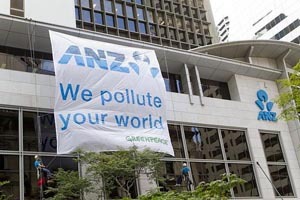 ↑ Climate Action Network Australia/NSW Environmental Defenders' Office, "Coal Power Proponent Pulls Out of Legal Battle", Climate Justice, Environmental Law Alliance Worldwide (ELAW), September 8, 2004. ↑ Linc Energy, "Australian Projects", Linc Energy website, accessed May 2010. ↑ 49.0 49.1 "ZeroGen Mark II", ZeroGen website, accessed August 2008. ↑ Griffin Energy, "Bluewaters Power Station Expansion", Griffin Energy, website, accessed August 2008. ↑ Andrew Burrell, "Japanese energy giants in $1.1bn Griffin power buy", The Australian, April 09, 2011. ↑ Office of Energy, Government of Western Australia, "Wholesale Electricity Market", Office of Energy website, accessed August 2008. ↑ "Direct action halts coal seam gas rig" NSW Nature Conversion Council, Green Left Weekly, July 5, 2011. ↑ 63.0 63.1 Ross Garnaut, "Targets and trajectories: Supplementary Draft Report", Garnaut Climate Change Review, September 2008, pages 14-15. "Heat treatment", Sydney Morning Herald, October 29, 2009. (Pdf) The document states that "this is a list of greenhouse gas emitting companies and peak industry bodies and the firms they employ to lobby government. It is based on data from the federal and state lobbying registers." 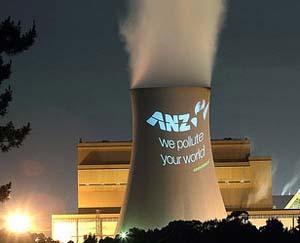 International Energy Agency, "Coal in Australia in 2005", International Energy Agency website, accessed June 2008. ABARE "Minerals and energy major development projects – october 2007 listing"
ABARE "Technology toward a low emissions future", December 2007. Pui-Kwan Tse, The Mineral Industry of Australia: 2006, U.S. Department of the Interior, U.S. Geological Survey, May 2008. This page was last edited on 5 February 2013, at 07:51.